Something very exciting is happening in Deerfield Beach, Florida on Sunday, June 7, 2015. A barge with fifteen concrete Moai Heads will be sunk ½ mile off shore in seventy feet of water. 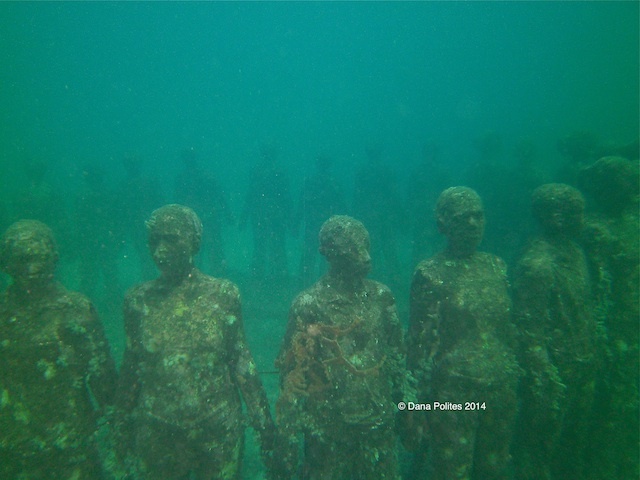 This elaborate public art project may be one of the most interesting dive sites ever created. The Rapa Nui Reef Project is the vision of Margaret Blume, Founder and Benefactor. Margaret wanted to do something BIG in environmental conservation using art. She had an idea about creating an underwater park and marine habitat using fifteen Moai figures. Her inspiration came from Easter Island, off the coast of Chile, famous for the Rapa Nui civilization that created 887 giant stone statues (Moai) over hundreds of years. After consulting with Arilton Pavan, owner of Dixie Divers, Margret brought the project idea to the Women’s Club of Deerfiled Beach and funded it with a $500,000 grant. 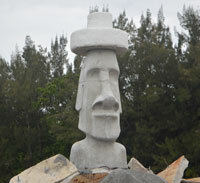 The planning committee then commissioned Artist Dennis MacDonald from Zibitz Studioz to create the Rapa Nui Reef. Southeast Dive News Correspondents Gene Muchanski and Dana Polites attended the “Break the Moai Mold Celebration” in Stuart, Florida on April 21st and got the rundown on the Rapa Nui Reef Project. Each of the 15 Moai Heads were cast in concrete in place, on the barge during construction, using giant molds. Hence the, “Break the Mold” celebration after the last figure was cast. The event was well attended; Members of the Women’s Club of Deerfield Beach, the Greater Fort Lauderdale Convention and Visitor’s Bureau, Deerfield Chamber of Commerce, District 1 Commissioner Joe Miller, Local Politicians, Diving Media and Local TV Stations, Jim “Chiefy” Mathie, Dixie Divers and numerous local divers and art lovers. The support for the project is incredible. The Rapa Nui Reef is built on a barge, 150 feet long by 45 feet wide and 9 feet deep. Dennis constructed a rubble wall around the 15 Moai Statues to serve as an underwater habitat for the fish population of Deerfield Beach. The project is well on its way and is scheduled to be completed by late May. On June 1st, the barge will be towed down the St. Lucie River, out to the ocean and down to Boca Raton and Deerfield Beach. After two days of dedications and public events, the Rapa Nui Reef barge will be sunk in 70 feet of water off the coast of Deerfield Beach. Jim “Chiefy” Mathie estimates that local Dive Boat Operators will start running charters out to the Rapa Nui Reef dive site as soon as the safety committee can establish that the project was sunk according to plan and it is safe to dive on the new man made reef. Fish and Lobster are welcome to adopt their new home immediately. The main source of information on Rapa Nui Reef can be found on their facebook page at www.facebook.com/RapaNuiReef A web site is currently under construction. By Dana Polites. Photos by Dana Polites and Gene Muchanski. 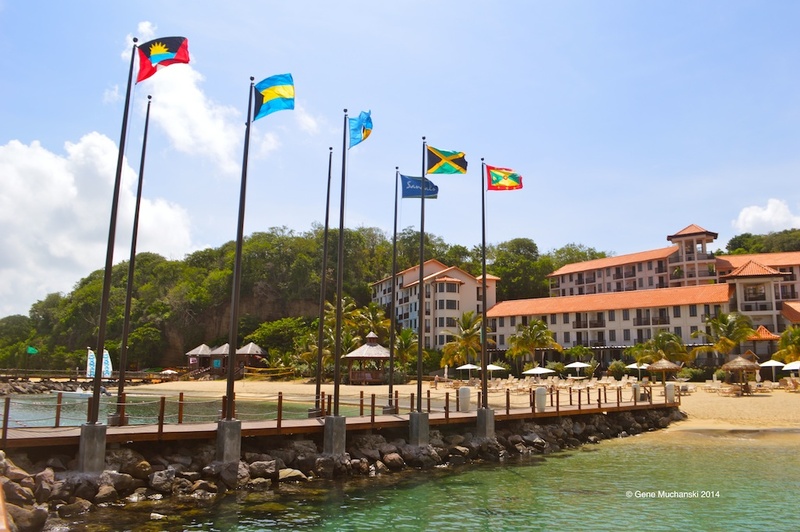 Recently we had the opportunity to travel to Grenada with a media group and stay at Sandals LaSource Grenada Resort and Spa on Pink Gin Beach. If you have been on an Eastern Caribbean cruise you may have visited this port. Grenada is an island country consisting of the island of Grenada and six smaller islands at the southern end of the Grenadines in the southeastern Caribbean Sea. Grenada is located northwest of Trinidad and Tobago and northeast of Venezuela. 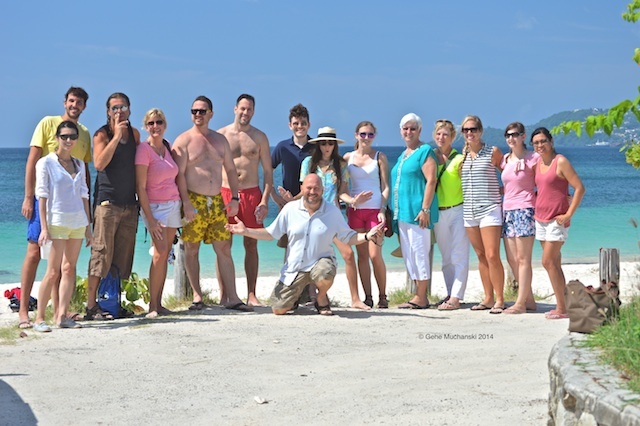 This was an international group of travel writers and photographers, all new to this property. We met new friends from Germany, the U.K., Italy, New York, Washington D.C and Los Angeles. Our hosts were Devyn Barker from The Decker Royal Agency, Jessica Culbreath, Sandals Public Relations and Katharina Schneider, Sandals Public Relations, Europe. We were excited for Devyn and Jessica as they were taking their resort diving course from the Sandals LaSource Aqua Center instructors. The property re-opened in December 2013 after a renovation and major expansion of an existing hotel. There are now 225 rooms including 69 professional butlers suites, 10 restaurants, 3 freshwater swimming pools, 2 river pools and a beautiful private beach. Sandals promises a Luxury Included® Vacation and delivered just that from the time you arrive at the airport to your departure. Wonderful food and service, unlimited top shelf drinks, Beringer wines, entertainment, snorkeling, scuba diving, stand-up paddleboards, kayaks and free Wi-Fi in all rooms beginning Dec ember 2014 are all included. From the very moment we were met at Maurice Bishop International Airport (M.B.I.A) we knew we were in for a great experience. Every one of the staff was friendly and smiling. We were greeted at check-in with a glass for sparkling wine, our bags were whisked away to our rooms and we were off to choose a restaurant for dinner. We picked Soy Sushi Bar for made-to-order sushi rolls like the Rainbow, a California roll topped with assorted sashimi, soups, sashimi, nigri and signature cocktails. What a way to unwind from our 2 and ½ hour flight from Miami! There is a restaurant for every taste at Sandals LaSource: Cucina Romana for Italian and Kimonos for Oriental cuisine. For French cuisine it is Le Jardinier and Butch’s is the new steak house. Spices offers buffet style dining for breakfast, lunch and dinner and Neptune’s is a great place for lunch or a stop at the bar in the afternoon. Dino’s is a walk-up pizza bar right next to a pool with a swim-up bar and Café de Paris offers pastries, crêpe, coffee and tea. And did I mention room service? The next morning we headed down to the Aqua Center for our first day of diving. We were fortunate to have Michael Clarke, Group Watersports Director, join us on the boat. Michael explained that it’s safety first at Sandals. PADI-certified staff; first-rate, twin diesel Newton custom-built boats and a partnership with DAN make for a great day of diving whether you are taking a resort course or have 7000 dives under your weight belt. If you choose not to bring your own gear there is plenty of Scubapro® equipment to go around. The Aqua Center staff; from boat captains to Divemasters to shop staff do everything they can to make sure divers and snorkelers have a great time. There are dive sites for every level of diver and an experienced Divemaster leads each group. We were lucky to have Chris leading our group. He did a heroic job of herding 6 Media Divers, 4 with still cameras and 1 with a video camera! A dive site not to be missed is the Moliniere Bay Underwater Sculpture Garden. Opened in 2006, this collection of underwater contemporary art is located about 15 minutes by boat from the resort and was created by British sculptor Jason deCaires Taylor. There are over sixty-five individual concrete sculptures, from solitary individuals to a ring of children holding hands, covering an area of almost 1000 square yards. We also dove Flamingo Bay’s wall starting at 23 ft. and dropping to 100 ft. It is a colorful reef with corals as well as sponges. Sandals LaSource is where diving and dining meet. After a day of diving there is nothing like having a marvelous dining experience. Thursday night dinner was at Le Jardinier or “the gardener” in French. Classic country furniture, fresh flowers and an open kitchen add to this romantic garden paradise. We enjoyed cocktails first, then appetizers. Picking an entrée was tough! Chicken Cordon Bleu, Braised Lamb Shank, Crabmeat and horseradish crusted fillet of Atlantic Salmon, Chateaubriand, which would you choose? Dessert was a Chocolate Buffet by the pool! Chocolate martinis, chocolate ice cream, chocolate truffles, chocolate cookies – a true chocoholic’s dream come true and a calorie counters nightmare! All the chocolate for these delicious treats comes from the Grenada Chocolate company who pioneered the cultivation of organic cocoa on the island. After breakfast the next day we headed off to the Aqua Center to board the boat for our second day of diving with a compliment of brand new divers ready to try their fins under the watchful eye of their instructor. We passed on the Bianca C, a 600 ft. cruise ship, sunk in 1961. A fire in the boiler room occurred just as she was anchoring in St. George’s Harbour. This is for advanced divers as the deck is at about 130 ft. where you can swim into the ship’s swimming pool and then continue to the bow. Our group chose Purple Rain for it’s abundant marine life and opportunities for photography. It has an enormous amount of bottom life: yellow, purple and orange sponges, coral whips and deep water. The M/V Veronica was our second dive site. It lies in 50 feet of water and is a beautiful artificial reef and home to frogfish in the summer. The third dive was back to the Underwater Sculpture Garden. The visibility had improved so we were able to find and photograph statues such as a man on a bicycle, a man at a desk with a typewriter and a standing Christ figure. The Boonoo-noonoos Beach Party is our destination for dinner tonight. First stop is the bar set up on the sand for a pre-dinner cocktail. A Caribbean feast of local dishes is waiting including the best jerk chicken I have ever tasted. While we were eating, there were dancers, stilt walkers and singers vying for our attention. One enterprising young woman is putting herself through medical school entertaining guests by dancing with fire. Saturday started off with breakfast with the General Manager of Sandals LaSource Grenada, Peter Fraser and some of his senior staff. This was a great opportunity to ask questions about the property and all the amenities available to the guests. After breakfast our group split up into two vans for a tour of the island. 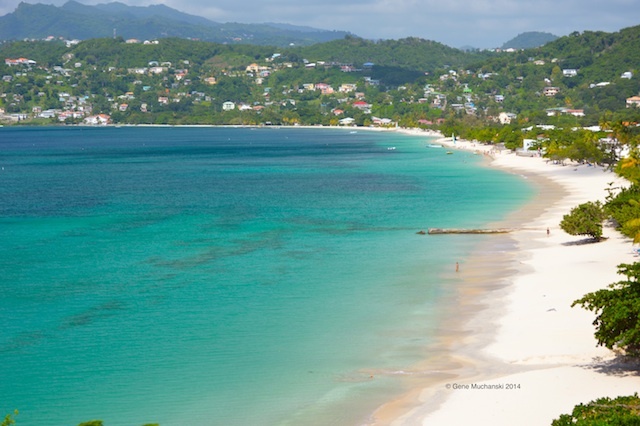 Grenada is 21 miles long and 12 miles wide, with an estimated population of 110,000. The island is of volcanic origin with extremely rich soil. Mount Saint Catherine is the highest point on the island at 2760 ft. Our first stop was Fort Frederick, built by the French to secure their position after they had so easily captured the island from the British in 1779. From the top we could see Sandals LaSource Grenada on the southwestern peninsula, the airport, the roofs of St. George’s University and Grand Anse Beach. Next stop was Grand Etang Lake and Forest Reserve, which is situated in the crater of the extinct volcano. This is a popular area for hiking and trekking. While we didn’t do much hiking we did pause for local rum punch and Carib beer at the Monkey Bar. Our next destination was Annandale Waterfall, but on the way there we stopped at a spice store located in the front yard of the owner’s home. Our driver gave us a hands-on course in the various spices grown on Grenada from nutmeg and mace (mace is the outer lacy covering of the nutmeg) to cinnamon, cloves, ginger, and cocoa. 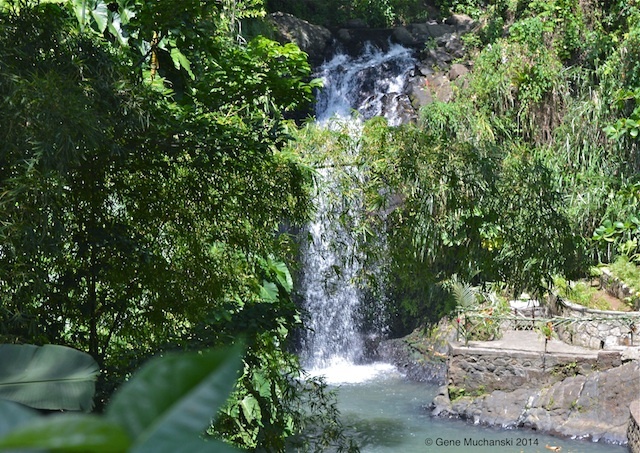 Once at the waterfall we walked down a well-tended path lined with local fruit trees and flowering plants. Being divers, some of the group decided to test out the warm water under the falls. Back down the mountain to St. George’s we stopped at the local Spice Market. Vendors sell everything from hats and flags to spice leis guaranteed to make your kitchen smell like a Caribbean breeze. Last stop was Grand Anse Beach, just outside of St. George’s. The beach is two miles of white sand and turquoise water, and has become a favorite for both visitors and locals alike. It is often included in the Top 10 list of Caribbean beaches. 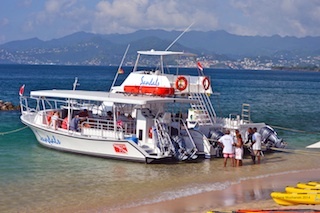 Our tour of Grenada complete we headed back to Sandals LaSource. After a quick trip to the room for a shower and a change to clothes we were off to the Red Lane® Spa for a couples massage. Island scents of ginger and nutmeg provided aromatherapy during the massage. What a way to relax after a day of diving or sightseeing! Spa services are an extra charge, but with the extensive menu of services you should be able to find something to splurge on. Back to the room to get ready for dinner at Butch’s Chophouse, Sandals first steak house and named after Gordon “Butch” Stewart, Chairman of Sandals Resorts. Dressed in Resort Evening Attire (no flip-flops men! ), we made our way past the pools and lounging areas to our last dinner. The menu is extensive and I was able to try Wagyu beef. In the United States, Japanese Wagyu cattle are bred with Angus cattle. This crossbreed has been named American Style Kobe Beef. It lived up to every cooking show I have ever watched. For those who chose not to order beef there was Catch of the Day or a vegetarian entrée. Again it was hard to pick a dessert but Chocolate Sin Pie seemed to be the favorite. After hugs and promises to friend people on Facebook or connect through LinkedIn we headed back to our room to finish packing. One last glass of wine on the balcony and we were ready to sleep fast for a 5:45 AM bag pickup. After coffee and pastries in the lobby we all loaded into vans for the 5-minute ride to the airport. Once there we had a chance for one last good bye to new friends before getting on the plane. Back in Miami, we zipped through immigration and customs, and re-checked our bags for the trip to Orlando and home. This was a wonderful trip and I can’t wait for the next adventure. About Dana Polites: I retired from The Boeing Company after 29 years. I am a California native, but got to Florida by way of nine years in Texas. We love living in Florida – great neighborhood, great neighbors and watersports opportunities galore. I have been diving for over 40 years and was a NAUI instructor before I had to grow up and get a real job. I am a Director of the Dive Industry Association and a Director of the Dive Industry Foundation. To celebrate Florida’s mini-lobster season, a little seaside village with a population of 6,000 residents annually sponsors a diving event called BugFest-By-The-Sea As new residents to the State of Florida, Dana and I gladly accepted an invitation to drive down to the beautiful Town of Lauderdale-By-the Sea (LBTS) to see what this event was all about. The following four days turned out to be one of the nicest diving vacations we ever experienced. The Town of Lauderdale-By-The-Sea, located just north of Fort Lauderdale, is known as the Shore Dive Capital of South Florida because of its beautiful coral reefs located less than 100 yards off the beach. Snorkelers and scuba divers alike frequent the shallow water reefs for the warm, clear water and abundant marine life, especially Lobster. So it makes a lot of sense to hold BugFest in a place that not only has great shore diving but plenty of Dive Boat Operators, Dive Stores, and a local diving community that comes together every year to volunteer their time to throw a party that welcomes all Divers who want to participate in a fun event. This year’s BugFest started on Friday, July 25th with a reception to showcase the Sinking World Art Exhibit of Andreas Franke and ended on Saturday, August 2nd at the Beneath The Waves Film Festival. There was something to do every day for the entire nine days. Over 200 certified divers signed up to compete in the Great Florida Bug Hunt with over $15,000 in dive gear and prizes. There was a mini-season kickoff party, four days of beach and boat diving, a beachfront Lobster Cookoff, a Lobster Chef Competition, and in the El Prado Park event there was a lobster cookout and Live Calypso Music There was even a photo & video contest and a “Catching The Bug Seminar” by local Author Jim “Chiefy” Mathie. 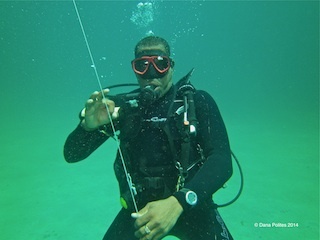 Promoting diving in the Greater Fort Lauderdale area is a cooperative effort between the local diving community, diving businesses and city, county and state entities. At the invitation of The Greater Fort Lauderdale Convention & Visitor’s Bureau, Southeast Dive News Correspondents Gene Muchanski and Dana Polites joined a group of Journalists to participate in BugFest-By-The-Sea and be treated to an entire “Diving and Dining” experience in Lauderdale-By-The-Sea and her neighboring cities. This was one dive trip we were really going to enjoy! Kaymi Malave, Senior Account Supervisor and Aubrey McGovern, Account Supervisor with the advertising agency M.Silver, and Jessica Savage of the Greater Fort Lauderdale Convention & Visitors Bureau were going to show us why Lauderdale-By-The-Sea was such a great destination for travelers, and I would have to say they succeeded. We met with Aubrey, our guide and dive buddy for the next four days at The Sea Lord Hotel & Suites. The Sea Lord Hotel is a beautifully updated AAA Three-diamond, oceanfront boutique hotel on Florida’s most exclusive stretch of beach. It has spectacular views from apartment-style accommodations. Our Media Group included writers from Southeast Dive News, Bonnier Corporation, and Advanced Diver Magazine. We were delighted to become dive buddies with the young Schyler Cox, the 2014 Bonnier Corporation Intern from the Our World-Underwater Scholarship Society. The Sea Lord Hotel is right on the Beach, peaceful and quite, yet close enough to our dive operator’s dock. The diving was provided by Jeff Torode, President of South Florida Diving Headquarters Not only was Jeff one of the promoters of BugFest, he volunteered to be our Host, Tour Guide, Dive Boat Captain, Dinner Guest and Local Tourism Ambassador. All we had to do in return was dive, take pictures & video, eat, try “FlyBoarding” and climb 132 stairs up the Hillsboro Lighthouse! Where Jeff gets the energy to do what he does is beyond me, but he definitely is the guy to call if you want a fun watersports experience in the Fort Lauderdale – Pompano Beach – LBTS area. We knew this dive trip was going to be all about diving and dining when Jessica and Aubrey arrived in the Greater Fort Lauderdale Convention & Visitor’s Bureau’s (CVB) van on our first night to take us to the Blue Moon Fish Co. a chic waterfront restaurant located on the Intracostal Waterway serving creative fresh Florida cuisine. This deco-inspired exterior with a contemporary American menu is on our “must go to” list for visitors to LBTS. The “Tower” appetizer, Mahi Mahi, and Key Lime Pie were our favorites. The excitement of the first day was upon us as we got in our CVB Van (Thanks Joseph Rodman) and headed out to meet Jeff Torode at South Florida Diving Headquarters . Our Dive Guide for the first two “bug” dives was non-other than Mr. Bug himself, Jim “Chiefy” Mathie. Jim’s written a book on catching Lobster and we knew we were in good hands. We set up our gear and took some pictures as the dive boat made its way to Chiefy’s secret Lobster spots. After two dives with Chiefy and his Divemaster, they had all the lobster they needed and we had all the pictures and video to prove it. One thing that makes a vacation interesting and well-rounded is when there are non-diving activities you and your family can participate in after your dives. After our first two dives we caught a quick shower and headed south to Nova Southeastern University Oceanographic Center in Fort Lauderdale. We were greeted at the newly constructed $50 Million Dollar Oceanographic Center by the NSU Staff; Wendy Wood-Derrer, Director of Development, Brandon Hensler, Interium Executive Director of University Relations, and Joe Donzelli, Associate Director of Public Affairs. Wendy shared the History of the NSU Oceanographic Center with us in their beautiful Boardroom overlooking the Atlantic Ocean. NSU is the largest private not-for-profit university in the Southeast and with an enrollment of more than 29,000 students, is the eight largest in the United States. Nova Southeastern University Oceanographic Center has been at the forefront of marine science education and oceanographic research for nearly 50 years. It is the home of the National coral Reef Institute, the Guy Harvey Research Institute, the Save Our Seas Shark Center, the Broward County Florida Sea Turtle Conservation Program and a number of other Institutes as well. We were able to catch up with Assistant Professor David Kerstetter and get the scope on some of his marvelous Lionfish Research. Having been on two dives in the morning followed by a tour of the NSU Oceanographic Center in the afternoon, it was time to check back into the BugFest and see how the Lobster Chef Competition was going. As you can imagine, the five culinary chef teams battled it out and after tasting the entries, only two were proclaimed as this year’s winners. There was an overall winner and a “Divers Choice” winner. See BugFest’s Facebook Page for all the details. If there was an award for best “Key Lime Margarita” we’d have to give it to our Host Jeff Torode, now wearing an apron and cooking for Serenity Yacht Cruises. BugFest was a great success and we look forward to participating next year. It was time to end our second day with a great dinner at 101 Ocean. “Casual but classy beach dining experience. Beautifully designed and decorated with a hugh outdoor bar.” Needless to say, the food quality was excellent and the service was above and beyond the norm. 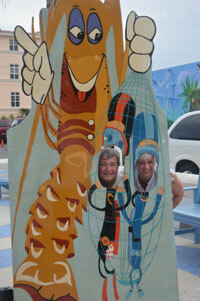 Our third day in Lauderdale-By-The-Sea showed us exactly how diversified and forward thinking Jeff Torode really is. 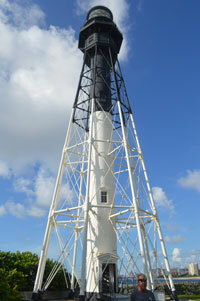 Jeff took us for a boat ride to the Hillsboro Lighthouse at the U.S. Coast Guard Station in Hillsboro Beach where we actually got to climb up the 132 stairs to the top of the Lighthouse and catch a breathtaking view of the Pompano Beach Inlet and surrounding area. Jeff gave us a history lesson of the area and then introduced us to Arthur A. Makenian, President of the Hillsboro Lighthouse Preservation Society. He knew every detail about the Lighthouse and about the barefoot mailman, who, as the story goes, got eaten by an alligator after someone “borrowed” his boat and he had to swim across the channel. After the tour, I snuck away to talk with an fellow Navy Submariner, Rob O’Neil, Lodge Host for the Recreational Cottages on the Lighthouse grounds. Retired Military personnel can actually rent two cottages on an available basis by making reservations with Rob at 954-781-1817. Besides pretty reefs and abundant marine life, The Greater Fort Lauderdale area boasts some pretty decent wrecks to dive on. Some old, some new, but all worth diving on. Our awesome DiveMaster Dave guided us on the Aqua Zoo, a Florida Wreck Site with the nickname for the piles of culverts next to the wreck of the Sea Emperor, and then on the United Caribbean, a Deerfield Beach Wreck Dive Site. Diving on these two wrecks with cameras and video was what we needed to get some good footage of the abundant marine life in South Florida waters. Divers are known for being good stewards of the environment and Brian Gagas of Gold Coast Scuba gave us an opportunity to participate in the Anglin’s Pier and Reef clean-up. After the dive we paid a visit to the Village Grille, right up the sand from the beach clean-up. Village Grille is a seaside culinary feast featuring fresh caught seafood, juicy steaks, crisp salads, sandwiches and many other specialties. Open for breakfast, lunch and dinner. And for those skipping the beach dive and still on breakfast time, I suggest the Egg & Bagel Sandwich! Wanting to get some more pictures and video of the reefs off of Deerfield Beach, we headed out to make a wreck dive on the Ancient Mariner, an ex-Coast Guard Cutter followed by a reef dive to blow off some nitrogen. When you’re shooting video and taking pictures, every dive is a new experience. If the current cooperates and the weather is good, there is always good footage to get. The Greater Fort Lauderdale Convention & Visitors Bureau didn’t want us to go home without showing us the night life of Fort Lauderdale, and the most scenic way to get there is by Water Taxi from Las Olas Marina. Our post-diving adventure continued as we explored the Intracostal Waterways that surrounds Greater Fort Lauderdale. The waterway is lined with multi-million dollar yachts and opulent mansions along Millionaire’s Row belonging to Fortune 500 company CEO’s, celebrities and other socialites. We kept our eyes peeled to see where all the Diving Equipment Manufacturer’s waterfront palaces were, but no luck. Taking a water taxi is a fun way to pass the time and travel from beach to downtown to Las Olas Boulevard’s upscale thoroughfare with al fresco dining and boutique shopping. Our ultimate destination for the evening would be the Royal Pig. “With a name like The Royal Pig, you’ve got to bring the goods when it comes to meat and poultry. The restaurant even makes its own sausage and foie gras.” The Royal Pig lived up to its reputation for food quality, and the restaurant certainly had an enormous amount of energy in it. Young crowd, loud music, and great service. On Sunday morning it was time to say goodbye to some of our Media friends and new dive buddies, but not to Fort Lauderdale. Shooters Waterfront just happened to be on the way to the airport and who would pass up an opportunity to have Sunday morning brunch at Fort Lauderdale’s most popular waterfront dining destination. 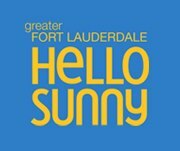 The restaurant features Fort Lauderdale’s most scenic Sunday brunch with a completely new look and a freshly inspired menu. With a 340 foot dock and great valet parking, guests are welcome to arrive by car or boat. The Greater Fort Lauderdale Convention & Visitors Bureau, M. Silver and South Florida Diving Headquarters could not have been better Hosts to us on this trip. The entire Diving & Dining Experience has made this Author think twice about the way we promote the diving industry and local diving. Thanks to Jessica Savage (Hello Sunny), Aubrey McGovern and Jeff Torode for all the effort you put into promoting local diving in the Lauderdale-By-The-Sea area. We encourage diving and watersports entrepreneurs to market and promote local diving in conjunction with their local Chamber of Commerce and their Regional Convention and Visitors Bureau or their Regional Tourism Bureau. Scuba Diving is a great recreation and it’s more fun when integrated with other lifestyle activities. Here’s to improving the recreational diving vacation experience. Isla Cozumel is a Mexican Island with a Caribbean flare. In a beautiful tropical setting, the island is alive with watersports activities yet enjoys a relaxed tempo of life. In this turquoise water, white sand beach, and lushly vegetated island you can choose to actively pursue your favorite watersport passions or do nothing at all. In her own way, Isla Cozumel caters to every visitor in a very unique and personal way. The Island of Cozumel is one of the better known and more popular diving destinations in the world. A beautiful little island off Mexico’s Yucatan peninsula, Isla Cozumel beckons to scuba divers and water sports enthusiasts from around the globe. Cozumel is accessible by major airlines landing at Cozumel’s own International Airport, cruise ships docking at one of its cruise terminals and by a short ferry boat ride across the channel from Playa del Carmen. Cozumel is a tiny island measuring 34 miles long from North to South and 8 miles wide from East to West. Cozumel has become the popular diving destination it is today for many reasons. First and foremost, the island is home to the second largest coral reef system in the world. The water is warm and clear and thanks to a mild ocean current, the scuba diving is almost effortless. The reefs are alive and abundantly populated with numerous species of fish, and thanks to the Mexican Government, are protected in Chankanaab National Park. Even the locals are not allowed to fish in this beautiful marine preserve. That means the marine inhabitants and the beautiful sea fans and coral reefs will be there for our enjoyment for generations to come. It’s easy to get to Cozumel. Scuba Divers normally choose to fly directly into Cozumel International Airport. The island is served by most major airlines including Aero Mexico, Air Tran, and United. Depending on the time of day and time of year, going through immigration is relatively painless. While some Resorts may pick you up at the airport, it’s not a problem if yours doesn’t. The main city of San Miguel is next to the airport and most of the dive resorts are on the main road on the other side of San Miguel. Shuttle vans are readily available for around $20 per person. Cruise Ships are a popular way to visit Cozumel. There is a Cruise Ship Terminal in downtown San Miguel and another newer terminal a few miles south towards Chankanaab Marine Park. Cozumel is currently the leader of cruise ship arrivals around the world. It is estimated that between 2 and 3 million “Day Trippers” from the cruise ships visit the shops of Cozumel every year. Another popular way to visit Isla Cozumel is by Ferry from Playa del Carmen. For years vacationers from Cancun and Playa del Carmen have taken the Ferry to Cozumel to visit this beautiful Island to enjoy the abundant watersports, shopping and restaurants. At $13 per crossing, the Ferry is popular with the locals and people who work on the Island. Scuba Diving has been a popular attraction for over 40 years on the Island of Cozumel and it is estimated that over 300,000 people come to Cozumel every year for the watersports. That’s not counting the 2 ½ million people arriving by cruise ships! The first and most respected dedicated Dive Resort on the island is Scuba Club Cozumel. Founded in 1976, this 61 room, waterfront Dive Resort has its own Dive Boats, Dive Shop and Restaurant. Diving doesn’t get any easier than walking out of your room and onto the dive boat that’s waiting for you at the Resort’s own dock. Managing Partner Timothy Massimino has been at the helm of Scuba Club Cozumel for 34 years now, overseeing a staff of 100-120 employees, some who have been with the resort for 20-30 years. Booking a trip for you and your dive buddy or a group of divers is as easy as finding a reliable Dive Travel Wholesaler like Scuba Travel Ventures or Roatan Charter. Working with a Dive Travel Specialist gives you a number of options in Airfare, Hotel Accommodations, Dive Operators and after dive attractions. Seasoned Dive Operator Dive Paradise has their own fleet of Dive Boats, Dive Guides and Dive Instructors as well as their own Boat Pier near downtown San Miguel. Independent Boat Operators like Sea Robin work with a number of Resort Hotels and arrangements can be made to pick you up at your own dock. A major factor to consider in planning a dive trip is the amount of equipment support you can get when you are miles away from home and your local dive store. 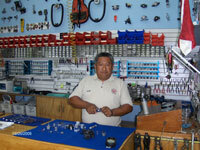 Cozumel has a number of dive stores scattered around the island but when it comes to repairs and hard to find spare parts, Cozumel Scuba Repair is the best place to go. Founded by former NAVY SEAL Larry Cleghorn, Cozumel Scuba Repair has personnel that are qualified as repair technicians for most of the major equipment manufacturers in the world. Knowing you can find that little 50 cent O-ring which saves your diving vacation goes a long way in making Cozumel next year’s dive destination of choice. The Island of Cozumel takes its diving very seriously. For your diving safety and enjoyment there is a Hyperbaric Chamber and Medical Center downtown by the waterfront. The Chamber is staffed by full-time Medical Professionals, including UHMS Certified Physicians trained to assist all Scuba Diving Injuries. The Chamber is a Member of the SSS Recompression Chamber Network and part of the Divers Emergency Assistance Network. If you’re into making six dives a day while on vacation, then Cozumel is a good choice for you. If your idea of a good vacation is waking up at 7 a.m., having a delightful breakfast, then packing your gear and going on the boat for a two tank dive, followed by lunch and a nap, then Cozumel is definitely your kind of place. And the day doesn’t end there. There is plenty of sightseeing to do on the island and many wonderful places to catch up on your Caribbean Dining experiences. Your taste buds can experience everything from Jimmy Buffett’s Margaritaville to the Fogo Do Brasil Steak House and an after-dinner cigar at Mini Havana. A good rule of thumb is not to make any scuba dives 24 hours before flying home. That last day on the island can be well-spent by renting a car and doing a little sight-seeing. A favorite place to visit is Hacienda Antigua, Tequila Factory & Store for a little Tequila tasting. It’s a short drive on Benito Juarez from downtown San Miguel, and being able to bring home a bottle of “Crema al Tequila” to pour on top of your ice cream will make you the talk of the town back home. Tourism is the bread and butter of many countries around the world. Political Leaders know how to roll out the red carpet for tourists if and when they want to. The Political Leaders of Cozumel always want to. Put Isla Cozumel on your “Bucket List.” You’ll be glad you did. Executive Director, Dive Industry Association, Inc.
DIA Dives with Dive Boat Narcosis: On December 10th, 2011 we had an opportunity to dive Palm Beach, Florida with legendary Dive Boat Skipper, Captain Van Blakeman. Our new friend from Palm Beach County, Dan Volker, set us up with a boat dive on the Dive Boat Narcosis and got us tanks and weights from Pura Vida Divers, in Palm Beach, Florida. With an early morning dive already behind us, Dan Volker, Dave Bertrand, Al Kidder and I boarded the Narcosis and headed out for a two tank dive. Despite the 6-8 foot swells on this otherwise beautiful almost winter day, Capt. Van put us on a nice wreck in 85 feet of water like it was child’s play. As soon as I hit the water and quickly began my descent, I realized that Palm Beach County was one of the best kept secrets of the diving world. First of all, it was winter diving and I was wearing my Oceanic 3/2mm full suit and a 3mm vest from Undersea Designs and by the end of the dive I was still warm as toast. Second, the visibility was great and there was little or no current on the wreck at 85 feet. For a dive that was just a few hundred yards off the beach, I was very happy to see Turtles and Goliath Groupers on the wreck. Boats in Palm Beach don’t anchor off or tie up to the wreck. They drop you off in buddy pairs or small groups on different parts of the wreck or reef. Each group has its own dive flag and each diver has his own Safety Sausage. The boat crew tracks each flag and picks up the divers as they surface. It was during our pick-up part of the dive when I saw first hand what an experienced boat captain we had. Capt. Van came in for the pick-up, swung the boat around, and put the swim step right in front of us for an easy boarding. WOW! I have to tell you, I haven’t seen anyone make a diver pick-up look so easy as Captain Van did that day. So yes, we will return to Palm Beach as soon as possible. Not only for the excellent boat diving with Captain Van but for the Whales, Whale Sharks, Eagle Rays, Manta Rays, Goliath Groupers, and the countless other photo opts that are waiting for us just a few hundred yards off shore. Captain Van Blakeman: Owner and Captain of the Dive Boat Narcosis. Captain Van has a love for the ocean, diving, and people that make Narcosis Dive Charters the perfect place for him. Starting back in Marathon, Florida in the late 1960’s, his work over the years with tugboats, while enjoying plenty of sailing and fishing, combined with diving experience ensures the confidence of his charter customers. His continued awe of the world, respect for the environment and desire to have fun keeps his customers coming back. North Carolina once again ranked # 1 in North America for Top Dive Destination, Top Marine Life, Top Big Animal Encounters and Top Wreck Diving. North Carolina diving also ranked 3rd in North America for Top Value and Top Advanced Diving as reported in the Readers Choice Surveys conducted and published by Scuba Diving Magazine. 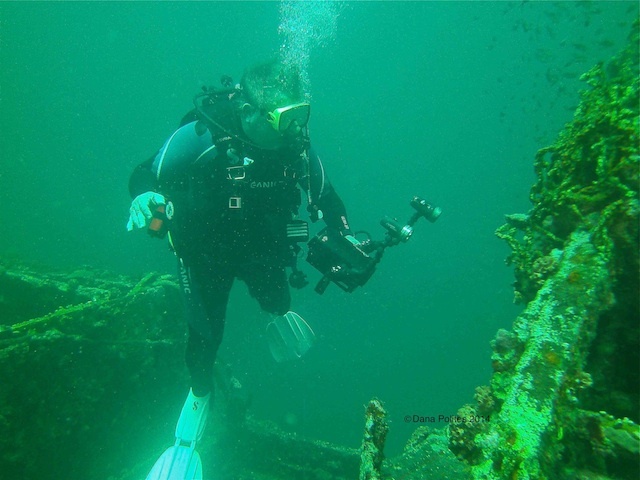 One of the largest Retail Dive Centers on the eastern seaboard, located on the waters of Historic Beaufort, North Carolina, is Discovery Diving Company, Inc. President Debby Boyce invites you to experience the mystery and beauty of many sunken vessels located off the coast. Know as the Graveyard of the Atlantic, there are numerous WW II ships that fell victim to enemy vessels as well as the German Sub, U-352, sunk by U.S. Forces. In total, there are over 28 wrecks that you can dive, including a WW I cruiser, Ocean liners, fish trawlers and many more wrecks for you to rediscover. There are also several artificial reefs, to include large ships and aircraft creating new fish habitats and fresh diving experiences. During the Summer, due to the proximity of the Gulf Stream, Beaufort has warm, clear waters with temperatures in the low 80’s and visibility often over 100 feet. They have large schools of pelagic fish, tropical fish, corals and a wreck (The Papoose) that is one of the premier shark dives in North America! Discovery Diving Company, Inc. is a full service dive shop offering sales, instruction, rental, repairs and wonderful days on the water with their own 3 exclusive charter boats and their competent and caring crews. They are within walking distance of restaurants, quaint shops and the North Carolina Maritime Museum in the Historical District of Beaufort. The shop is also within paddling distance of the Rachel Carson Estuaries Sanctuary and the most southern outer bank of the Cape Lookout National Seashore, great for after-diving outings. Take advantage of the shop’s weekday special available for groups of six or more for only $455.00 (plus tax) per diver. The cost includes 4 days of diving and 5 nights of lodging in one of our Divers Lodges. Have you ever been in the mood for something different? Well, after 40 years of diving, I was. It was close to Thanksgiving and Dana and I were looking for another dive trip to go on. Being in the diving business, you can imagine that my office looks something like a mix between a well-stocked library and an old attic, filled with diving catalogs and brochures of every imaginable exotic dive destination on the planet. After many hours of deliberation and a number of phone calls to our dive travel friends, we decided to go some place that was different and exotic, yet convenient; some place that had other things to do besides great diving; some place that we have never been to before; and some place where we knew somebody (so we could celebrate Thanksgiving with friends). A quick phone call to Cheryl Arscott at Dive Reservation Services, Inc. did the trick. Cheryl said, “Why don’t you go see your good friends Bill & Nadine Beard from Bill Beard’s Costa Rica? After the customary, “Why didn’t I think of that?”, Cheryl turned us over to Betty Tsitrian to book the trip. Betty had just returned from a Travel Agents FAM trip to Costa Rica and got to see everything, go everywhere and met everyone. Betty took care of all of our arrangements and was fantastic on every little detail of the trip. All we had to do was tell her when we wanted to leave and when we wanted to return. Betty took it from there. Bill Beard’s Costa Rica was the perfect choice. Bill has been running adventure tours in Costa Rica for 38 years, so we knew we were in good hands. Their web site tells the whole story: http://www.billbeardcostarica.com We booked our flight with Continental Airlines out of Houston Bush International. The flight was a 3 hour 35 minute direct, non-stop flight into Liberia, Costa Rica (Central Costa Rica). After a quick 20 minute drive to Playa Hermosa, on the Pacific Northwest side of Costa Rica, we arrived at our Hotel, Villa del Sueno. In playa Hermosa, you have your choice of many different types of hotels, all of them close to the beach. The fresh fish dinner that evening in Villa del Sueno’s restaurant was excellent, and with the favorable exchange rate, a good value for our money, too. For the next two days we dove with Bill & Nadine Beard off the coast of Playa Hermosa, with Ocotol Beach Resort’s diving operation. Diving on the west coast of Costa Rica reminded me of diving in California, only warmer. The boats we used were all professionally run with a Captain and two Divemasters. Our Divemaster was an experienced Diver and very charismatic. But aren’t all Divemasters? The Divemasters at Ocotol actually get in the water with you and act as underwater guides. They even take your gear back to the dive shop and wash it for you. What a great dive staff! We wanted to see as much of Costa Rica that we could, so Betty set us up with a driver, Edgar Cuadra Cespedes, to take us to the Arenal Volcano. Thanks to Edgar’s expert knowledge of the area and his great personality, we learned so much about Costa Rica and saw an incredible amount of the country side. Believe me, having a private tour guide is the best way to see Costa Rica. The three hour van ride was filled with a ton of things to see and do. We had an enjoyable ride and saw a number of volcanos and ecidence of their past eruptions. Edgar took us to a zoo, where we got to see some of the local animals up close and personal. After lunch in a great café, we were on our way to Arenal Kioro Suites & Spa. No, there is nothing like having a room with a direct view of an active volcano, just up the hill from your room. You can actually view the volcano from the safety (?) of your in-room spa, enjoying a glass of wine! We decided to end the evening with a dinner and an eight-hot spring pools and hydro-massage experience at the hotel-owned Spa, Titoku. The next day was action packed from morning till night. Betty and Edgar must have thought we were 20 year olds or something, with the way they packed our schedule. After breakfast we experienced a horse back ride to the tree top canopy area and had the thrill of our lives on the zip-line canopy tour. YaaaHooo! We toured a rain forest national park and hiked for miles at the Arenal Volcano National Park. After dinner were just too tired to go dancing so we opted for a soak in our in-room spa…overlooking an active volcano, of course. Aaahhh. The last morning at the Arenal Kioro Suites & Spa was reserved for breakfast at Heliconias Restaurant and a spa treatment for Dana at Nedin Spa. Right on time, Edgar picked us up for another exciting tour back to Play Hermosa, filled with frequent stops to see a Toucan, a howling monkey or God knows what else! Edgar was definitely fun and full of surprises. We ended up leaving Costa Rica with hundreds of photographs and an experience that will have to be repeated soon. Very soon. Like they say, “come for the Beauty, Stay fr the Adventure.” Thank you Bill, Nadine, Edgar, Cheryl and Betty. It was an experience of a lifetime. Purra Vida! (Pure Life).